Windows Only (Windows 7 or newer recommended). The Craigslist Client is not currently compatible with Apple/Mac Operating Systems. Default PC browser must be used for install. PC must be turned on, user that installed application must be logged in, and application must be running in system tray during any scheduled posting times. After clicking the Download Installer button, a notification from your browser should prompt you to Run or Save the downloaded program. 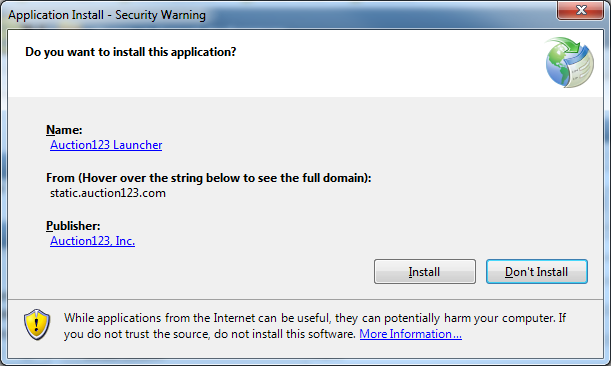 After the application begins to run, you may receive a Security Warning confirming that you want to install the application. Now, you should see an Auction123 logo in your system tray. You’ll need to right click the 123 icon and click Finish Setup. You have successfully installed the Auction123 Craigslist Client. Doesn’t work. Installer won’t run after selecting “run as admin” from download folder. All prerequisites met for java and net 4.0. Launching application window appears and then nothing. Troubleshooting section of this page is very lacking. Sorry to hear you are having trouble. Please contact support @ (888) 514-0123 Option 2 and they will be able to assist with any issues you are having installing the Craigslist application.